Travelocity may have parted ways with the agency that created its famous Roaming Gnome character, but the pint-sized spokesman is still a fixture in the online travel agency's advertising—and now he's doling out advice on how to get the most out of a trip. Campbell Ewald launched its first ad for the brand on Friday after winning the account in September. "Do not mistake this for a vacation," opens the voiceover as a surfer in a wetsuit strolls down a boardwalk toward the ocean. "This is a journey—a journey where maps give way to meandering," it continues as a couple amble through a rolling valley. Elsewhere in the 60-second commercial, a woman lounges, unhampered by her busy schedule back home. Mostly, though, themes of exploration and discovery are developed—another woman jumps off a cliff into a natural pool. 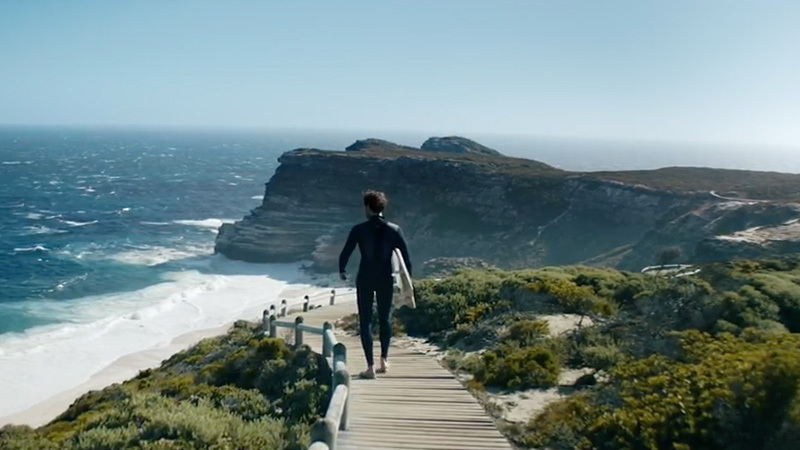 There's the obligatory gorgeous safari shot, then the camera cuts back to the surfer as the copy waxes on about the importance of new adventures. "Wander. You won't get lost. You might even find yourself," it says. The frame zooms out to a hillside, where the gnome perches like some kind of benevolent travel god, overlooking the wave-seeking protagonist running down the beach, finally in gear. "Or at least, someone who looks really, really familiar, but tells much more interesting stories," the gnome concludes. It's well written and charming enough, playing to millennials and their widely perceived love of experiences (Travelocity also hired a new media agency to reach a younger audience). Regardless of age group, it's hard to argue with the basic—if not particularly groundbreaking—logic that travel is personally enriching, and probably more exciting than the average workday (unless you're the real-life equivalent of George Clooney's character in Up in the Air—if so, give yourself a staycation instead). The tagline, "Wander wisely," does a fine job of summing up the ad's spirit, include its slightly pedantic and patronizing air. In the end, though, it isn't surprising that the globetrotting lawn ornament—created by McKinney during its first crack at the business in the mid-'00s—is still part of the brand strategy: Travelocity's execs literally brought the prop with them when they flew over to tell Campbell Ewald that it won the account last fall.